At the end of K-W United’s 3-1 loss to Forest City London on May 31, Wilfrid Laurier University men’s soccer coach Mario Halapir approached goalkeeper Nathan Ingham at the end of the game and told him that they were going to win it all. Three months later, K-W United Football Club won the Premier Development League championship for the first time in franchise history against the New York Red Bulls. “Winning anything feels great. I love winning,” Halapir said. K-W United is a group of university-level players looking for competitive play during the offseason that doesn’t use up their eligibility. 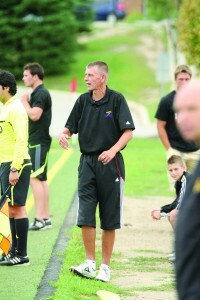 Halapir became an assistant couch, finding himself alongside women’s soccer head coach and K-W United president Barry MacLean. The two of them were reunited after Halapir served as an assistant coach to MacLean for the men’s soccer team before taking over head coach duties in 2008 when MacLean took over the women’s team. “I really enjoyed it,” Halapir said, reflecting on his experience coaching K-W United. With such a short season, Halapir said one of the biggest challenges the team faced was trying to build chemistry. When the players don’t play with each other on a regular basis, it can require patience for both the coaches and the players. “There was a bit of a learning curve for [the players] from an expectation point of view because you can come into the summer and you can think that it’s more of a summer time league that is going to keep you semi-fit,” he said. As someone who enjoys coaching different levels of play, Halapir stressed the importance of having expectations of players who play in the PDL league in comparison to the varsity league. The expectations of what coaches can expect from the players at each level also changes. “It’s going to be a little bit different, but understanding what you can expect from players and what you can’t is something that you have to adapt to,” he said. Moreover, Halapir felt the players needed a little more time to learn the tactical side of things and adjust to the strategy, just as a team would at the beginning of a university year. The boys had a rough beginning, but as the season moved forward, they were able to adjust and come through.